Vincent Mistretta recently had a thought-provoking post asking: Is there a difference between "birding" and "bird photography"? He goes on to explain that they "are NOT the same thing" as they generally require completely different preparation and frame of mind in the field. 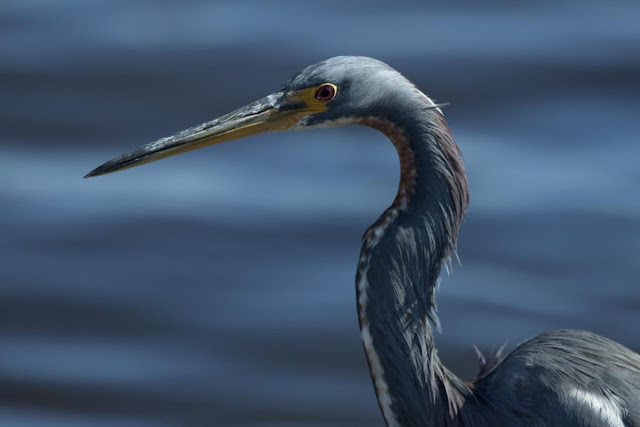 I get where he is coming from and agree with his explanations, yet I see "bird photography" as being one of the many fun activities under the greater birding umbrella. Rather than try to separate various bird related activities into separate hobbies or professions, I think of them as interrelated activities as part of the greater whole of "birding". From professional scientists studying minute details to the young child feeding birds in the backyard...from the obsessive Big Year lister to the patient and dedicated bird artist...these are all birders in my mind. 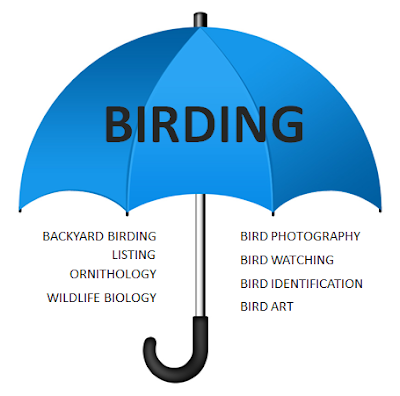 Maybe its because I personally enjoy and appreciate each of these birding activities that I feel it all belong under one umbrella. I'm sure you could come up with several more categories that fit under the umbrella of birding. When I think about the popular birding/birdwatching magazines, they share from all of these genres of birding. As Vincent suggested, certainly the mindset or focus one has in the field may be different for each activity, especially when a group is involved. I am surprised at how many of these activities can be done simultaneously. There are of course extreme enthusiasts within each of the elements of birding. And there are some people who might claim to only belong to one of the categories and separate themselves - take themselves out from underneath the birding umbrella if you will. I suppose it doesn't really matter how people define themselves. I'd just hate to see a bird photographer feel excluded from wonderful world of birding in which he or she rightly belongs. 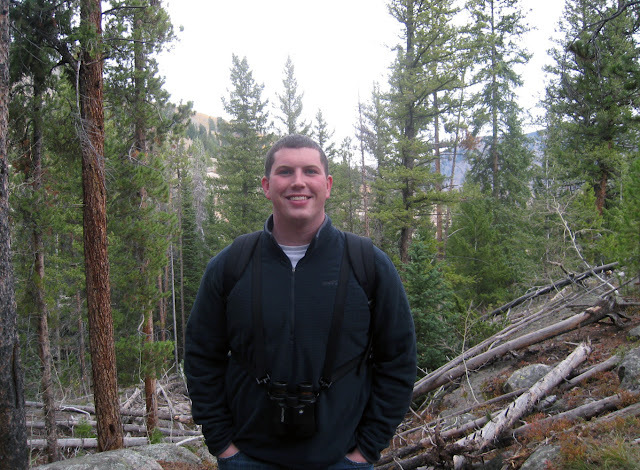 I'm all for greater unity, cooperation, and inclusiveness, because each aspect of birding is fun! 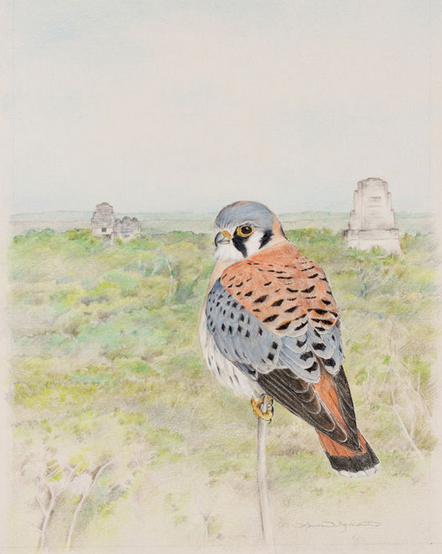 Just in time for the holidays, the American Birding Association (ABA) is auctioning Louise Zemaitis's original colored pencil of "American Kestrel at Tikal". I had the good fortune of meeting Louise at the Midwest Birding Symposium. This artwork is all the more special in that it is the symbol of the first ever ABA Bird of the Year. How collectible is that?! Another nice aspect of this auction is that half the proceeds will go to American Kestrel conservation and the other half will go toward advancing the ABA's mission. The starting price is $1000, so go talk to your rich uncle about buying it for you. Or if you know potential donors that are passionate about kestrel or falcon conservation, encourage them to bid on this fantastic piece of art and ABA history as a donation to the cause. Click here for the auction site. I'll be tracking the auction with the gadget in the sidebar. A couple other really cool items will be auctioned off by the ABA soon too. You won't want to miss it! I have a better than average record chasing rare birds, and yesterday I was finally able to see a Pink-footed Goose, a bird I've chased and missed and not chased several times over the years. 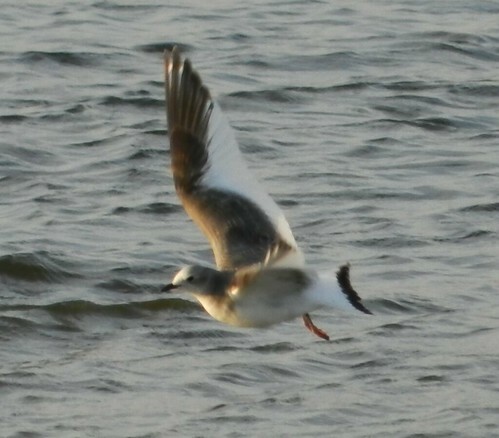 That leaves just one big jinx bird missing a profile on my ABA list, my biggest jinx bird so far...Slaty-backed Gull! The jinx probably started in high school in Oregon. 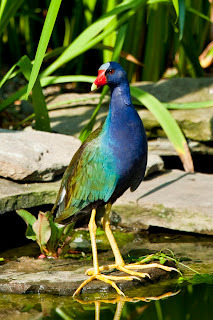 There weren't any records for the state, but I would dream about finding this bird. One time I almost convinced myself that I found one in a downtown Portland park. But it was just youthful wishful thinking. 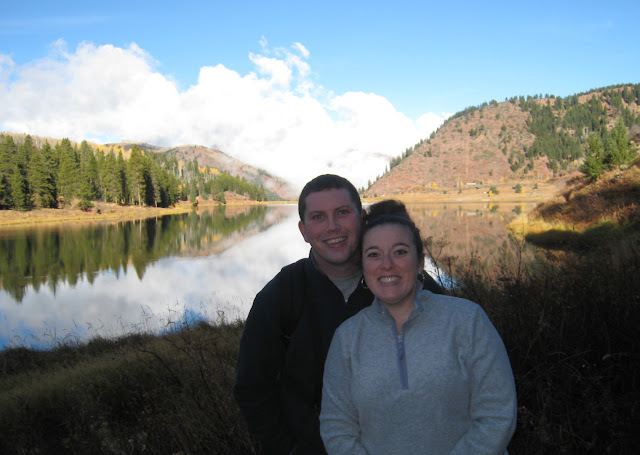 Then when I went off to Utah for college, what started showing up every winter during the early 1990s in my old stomping grounds? Yeah, that's right, our good buddy the Slaty-back! My very first week in Texas, back in April 1995, I was hitting the Upper Texas Coast for the first time, enjoying the shorebirds at Bolivar Flats, when a woman with a big camera lens tried calling my attention to a dark-backed gull in a gull flock on the beach. I did a quick look and didn't see anything, so I thought the unknown birder was just confused. But then there it was--a dark-backed gull with the brightest pink legs I've ever seen! As I was getting another birder on the bird, a jogger with a dog upset the whole flock and they were gone! Ugh! There weren't any Texas records of Slaty-backed Gull until several years after that, but my gut tells me there's a good chance that's what I had on the beach that day...slipping through my fingers. People, keep your dogs from running through the gulls, please! 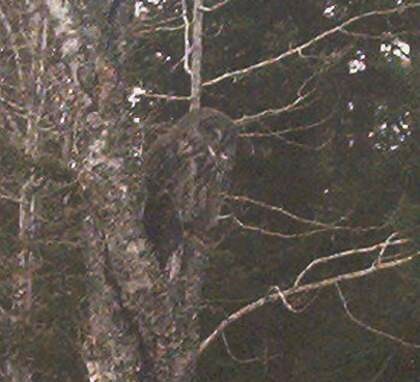 And what ever happened to those photos, mystery birder? 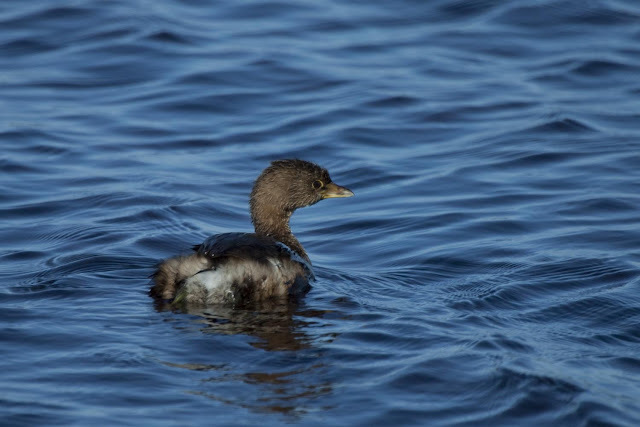 I've since chased Slaty-backs in Pennsylvania, just 30 minutes from the Audubon office where I worked. Got there 20 minutes too late. 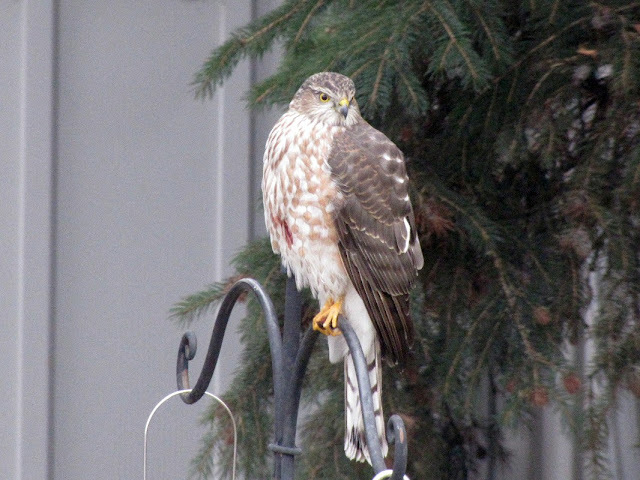 I'm also probably the first person to miss the bird that was in Ithaca, NY a few years ago. It was there the day before, and several days after I was there. But on the one day I was visiting the Cornell Lab of Ornithology, we dipped on it at the campus compost pits twice and at the traditional roost on the lake at dusk. That was a long drive home to PA after missing that one! 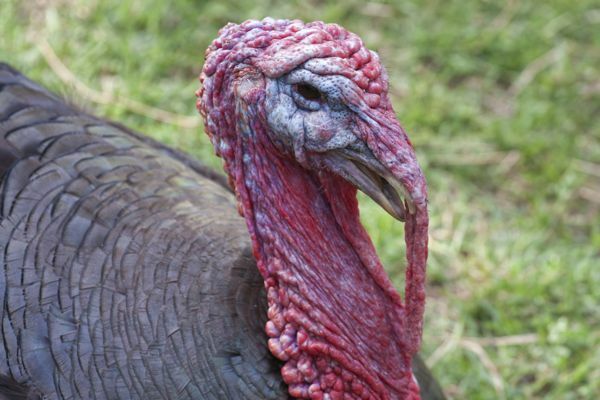 So, Mr. Slaty-backed...you are on notice. Now that my attention is not being divided by the formerly missing goose, I'm coming for you next! Why don't you just make it easy on yourself and show up at the Spruce Run Reservoir boat ramp just up the road from my house here in New Jersey. You know you want to! I'm sure I'm not the only birder out there with a jinx bird. Anyone else care to share theirs? American Bitterns are one of my favorite birds. I love them in part because they are so hard to find. 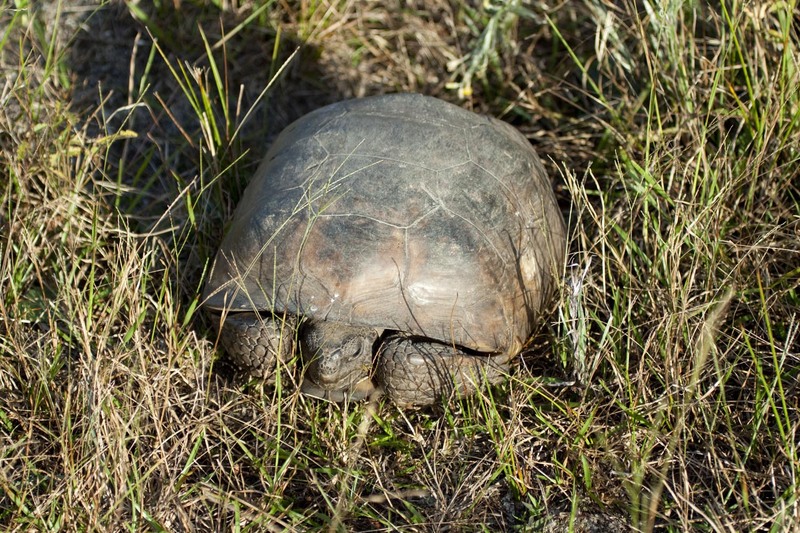 They tend to stay hidden in cattails and bulrushes while searching for fish, reptiles and amphibians, and their coloration is wonderful camouflage for them. So every time I see one, it's a real sense of accomplishment for me. 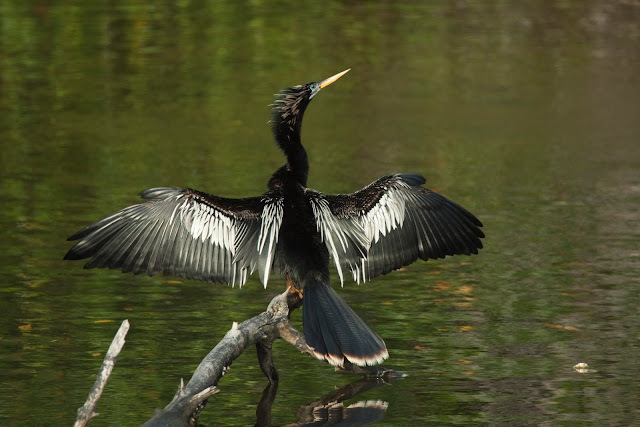 My search to find and photograph American Bitterns has taught me a little about the art of observation. 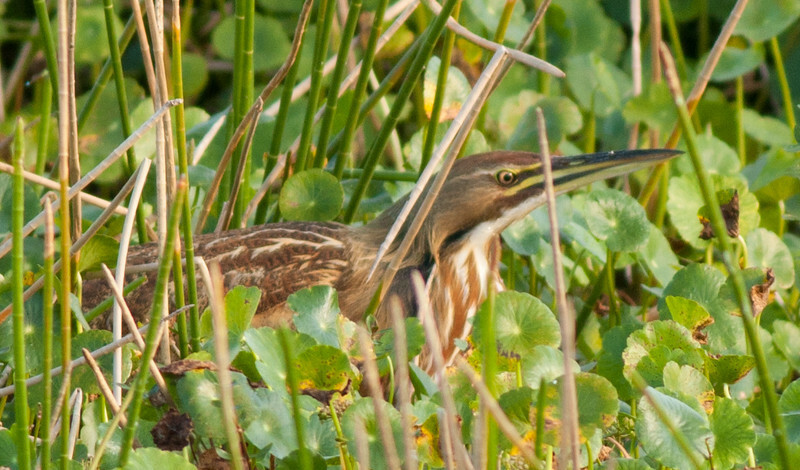 Earlier this month my dad and I were at Viera Wetlands, and we saw what looked like the bill of a bittern sticking out of the top of the reeds. As we approached, it disappeared. So we waited, and waited. 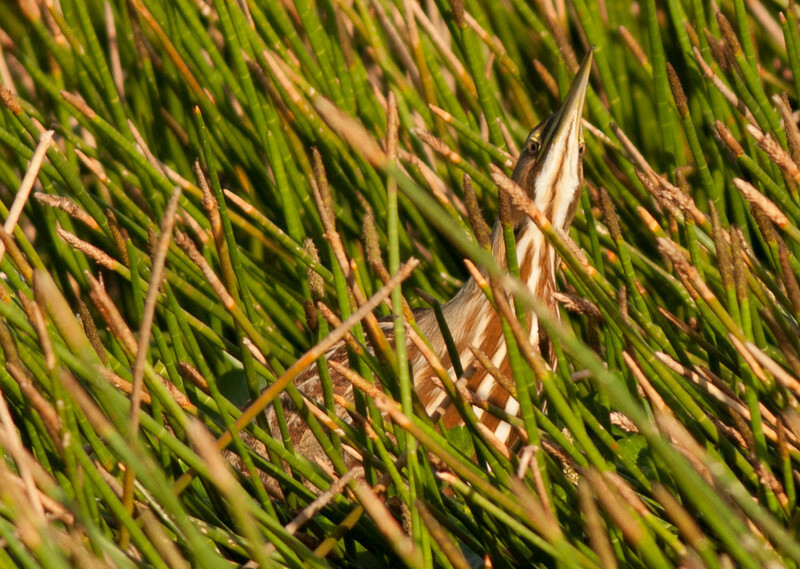 Eventually, we saw a beautiful American Bittern stalking something in the reeds. We watched for about 10 minutes, and he became progressively more bold, sticking his neck up so that we could have almost a full view of him. 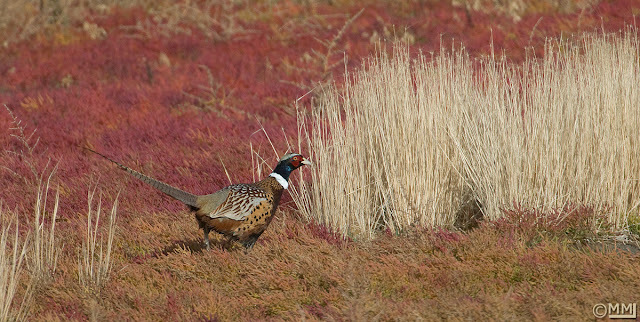 Know about the habitat of the birds you want to find. 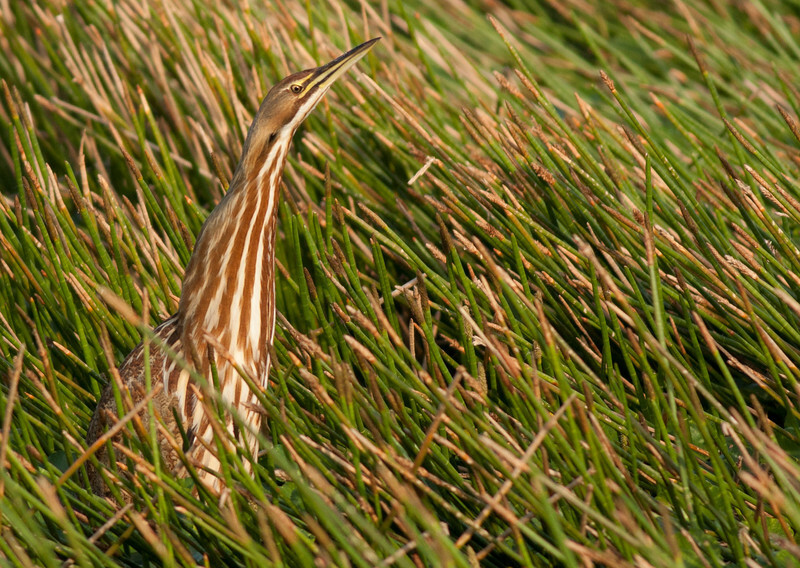 Since we knew where to find the bird, we paid special attention to areas where the bittern may be hiding. Know when to look for the bird. 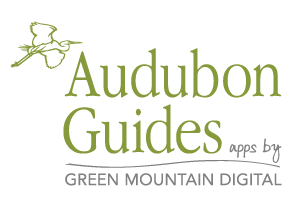 The eBird website has valuable information here. 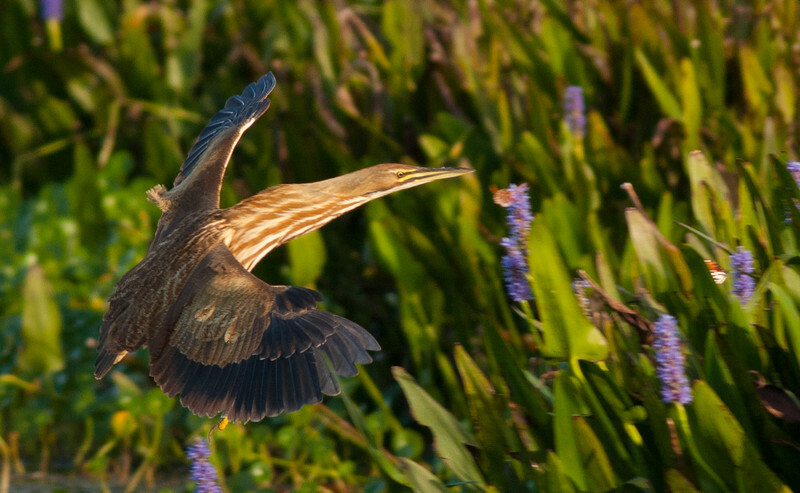 It tells me that the American Bittern is found most commonly at Viera Wetlands between October and April. So I knew in November there was a decent chance of one being there. Learn bird calls. If you recognize the "ker-plunk!" 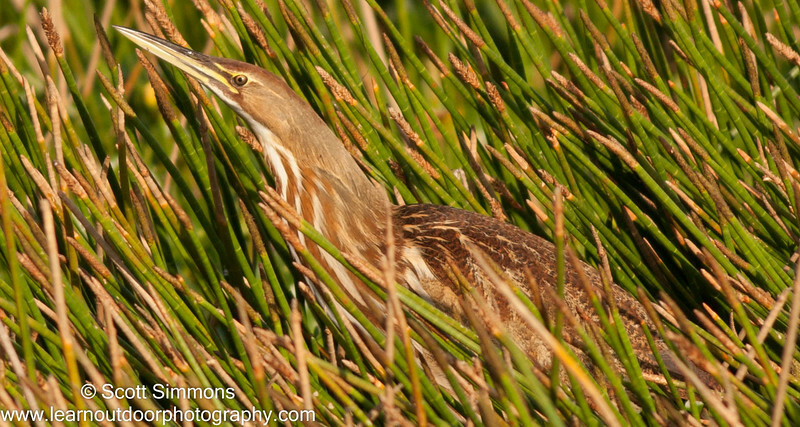 sound of an American Bittern, you'll know to stop and watch. Look for movement. When we saw only one section of reeds moving, we knew it wasn't the wind. The bittern was on the move. Walk/drive slowly and quietly. I suppose this goes without saying. 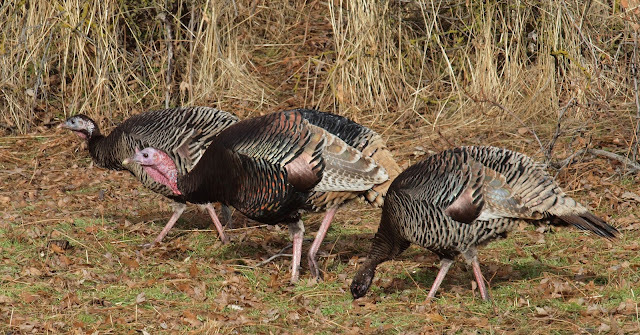 It's easy to walk right by birds that are good at hiding, and it's easy to spook them with noises. 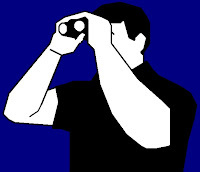 Take the time to be observant, and look at the same area from several vantage points. Stay concealed as much as possible. If you can remain behind a tree or other obstacle, you wil be less threatening. Staying low to the ground also helps. For some birds, staying in your car is less threatening than leaving it. I stayed in my car to photograph this bittern. If I opened the car door to get closer, I suspect that the bittern would have crouched out of view or flown away. Be Still. When we see the bird we're looking for, we're often quick to move our camera or binoculars up to our eyes. 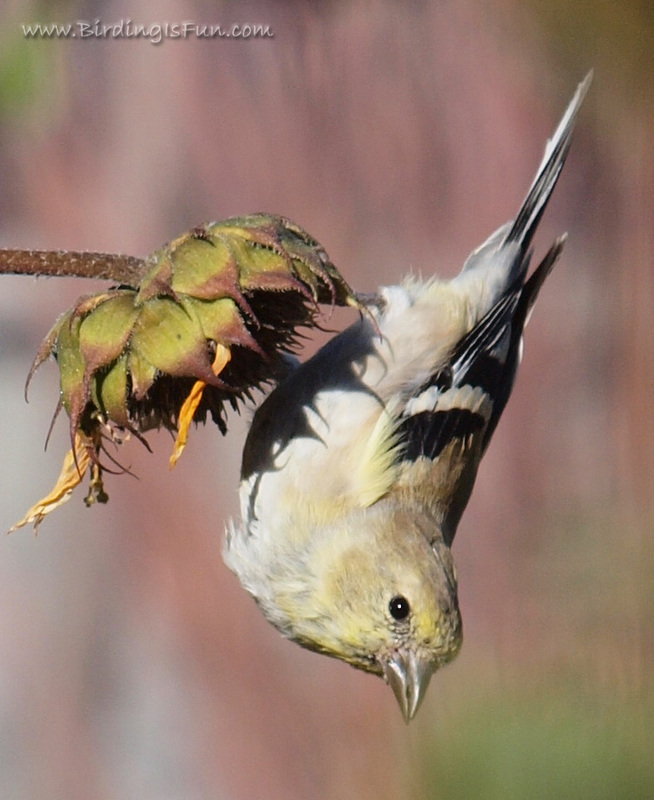 But sudden movements even as small as this can cause the bird the bird to fly away. If I'm anticipating finding a bird, I raise my camera up almost to chin level so that I don't have to make any quick movements to get the camera to my eye. Looking out my kitchen window a few days ago, my eyes nearly bugged out of my head. 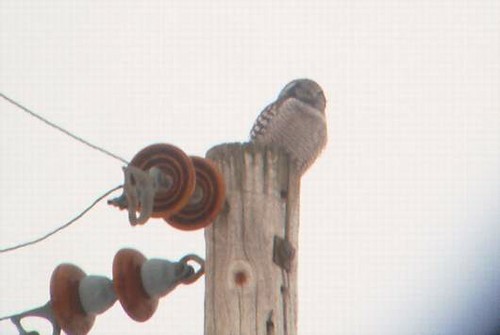 I had company, majestically perched atop my feeder pole. 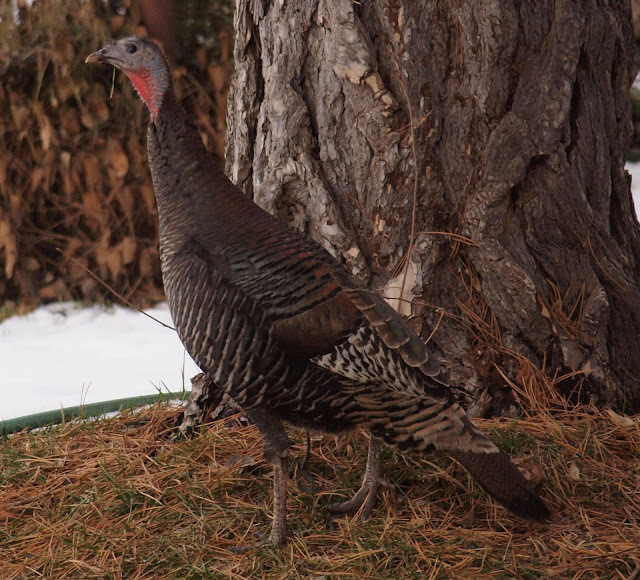 Needless to say this was the only bird in the yard at the time. Finally he moseyed over to hide himself in the spruce tree, to sit and watch the cats in their run, which is thankfully fenced on top. 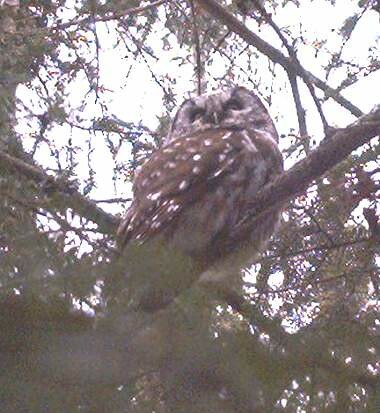 The first rule of bird watching is that no bird shall go unidentified, particularly one this obliging. Raptor identification can be quite a challenge, so I thought I would share the birder's thought process in case you're ever in this situation. It went something like this. Wait is this bird injured? Whew, no it's just wearing some of its lunch. 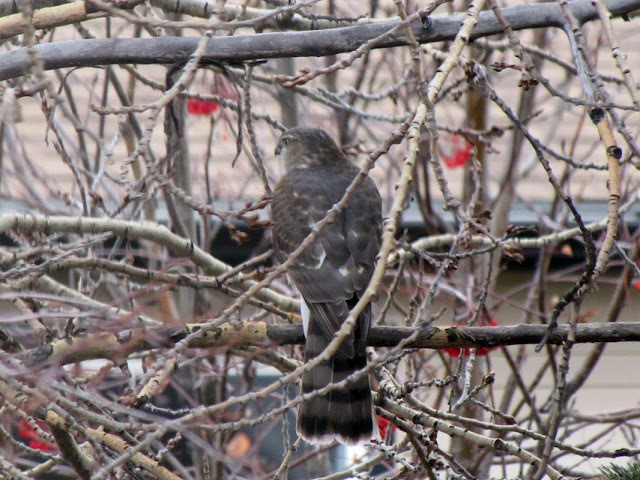 OK I think this is either a juvenile Cooper's Hawk or a juvenile Sharp-shinned Hawk. 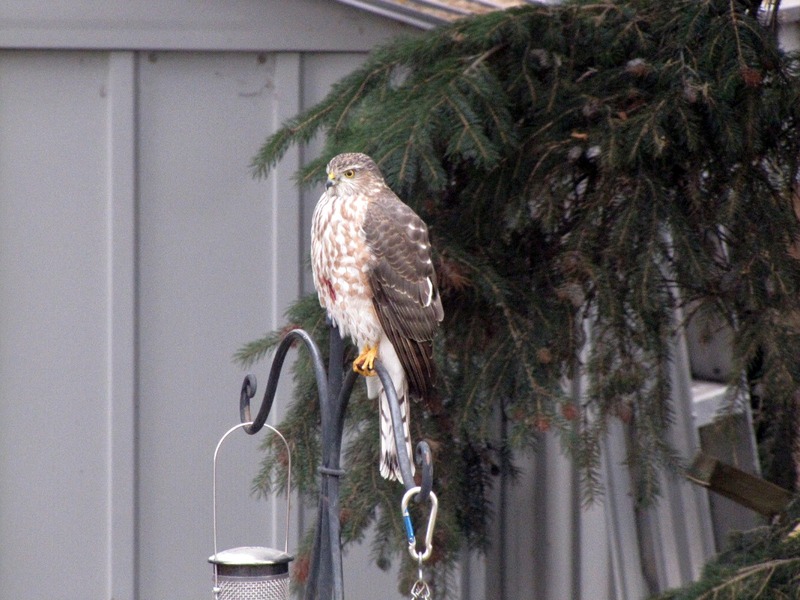 Juvenile raptor identification? Hmm. I'll think about it over lunch. Maybe a liquid lunch. Fortunately a fellow birder dropped by in the afternoon. I pulled up the pictures on my computer and we got down to the serious business of identifying my hawk. Eyes: Cooper's straw colored, Sharpie and Goshawk yellow. Well that helps. Breast: Cooper's and Goshawk heavily streaked with brown, juvenile male Sharpies have dark brown streaking. Thank you so much. Back: Cooper's is brown with white spots, Sharpie is brown, Goshawk is mottled brown. 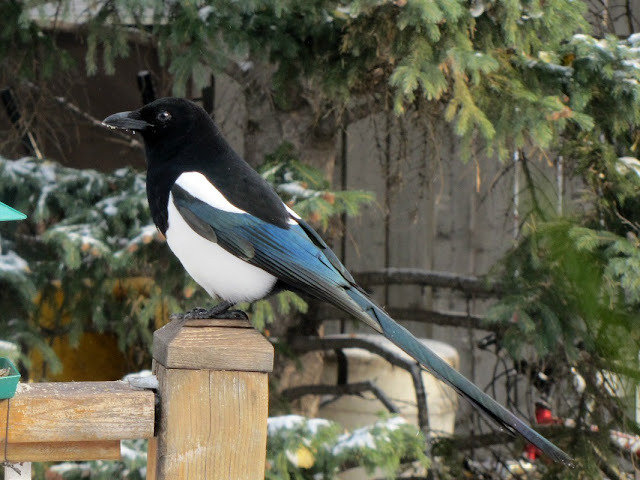 Oh look, is that Black-billed Magpie out the window? A nice, clear black and white bird? Oh right, the hawk. That's a fairly noticeable pale eyebrow - let's work on that. Location is often a good clue, except that all three are found here. Oh wait, it's November so the Sharpies have (probably) migrated. We'll eliminate them. At this point we had a variety of bird books spread across the table, had scrutinized every photo, and killed a lot of time. We were running out of field marks to check, and then we looked at the undertail coverts. 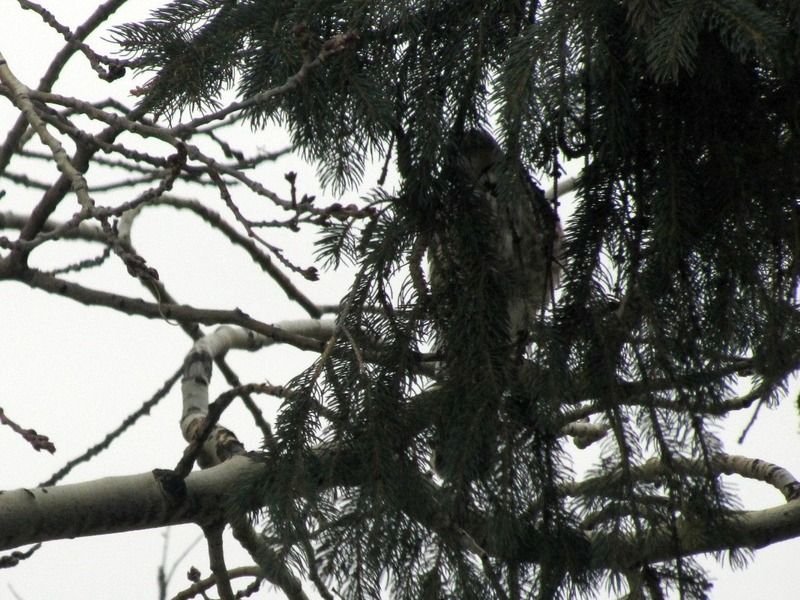 Cooper's is entirely white, Goshawk is white streaked with brown. EUREKA! 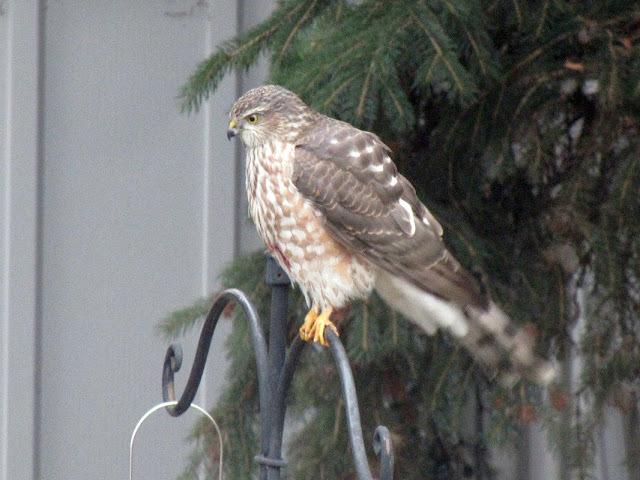 I had photos of a juvenile Cooper's Hawk. This whole process took two of us a great deal of time, pouring over bird pictures, scrutinizing every body part on the bird, explaining to each other what worked, what didn't and why. Juvenile raptor identification can be brutal - it couldn't have been much more complicated if we were trying to design a jet engine from scratch. Is this a great hobby or what?! Every winter, I seem to have to relearn my ducks. On a recent visit to my lunch hour birding patch, when I first arrived, there was a single brownish duck out on the pond mixed in with the coots. No crisp plumage males were with it to clinch the identification quickly and easily. The i.d. threw me off for some time. I admit that I didn't recognize the species by name and had to open up my field guide once I got back to my car. NatGeo6 is the field guide I had with me at the time, and it helped me identify it as a female Ring-billed Duck. 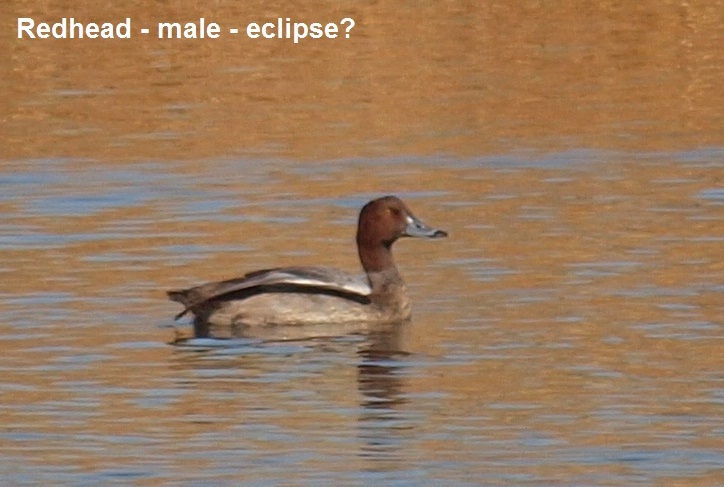 Same lunch hour, but about a half hour later, the Ring-billed Duck had flown, but there was a different brownish duck. You'd think this i.d. would be easy enough for me, but this one threw me for a loop too. The sharp contrast of the head to the body, right at the neck, along with the yellow eye pointed to Redhead, but the heads wasn't as bright as I'm used to seeing and the body color just wasn't right. When I got back to the office, I pulled out my Stokes guide which is the only field guide I have that shows Redheads in eclipse plumage. 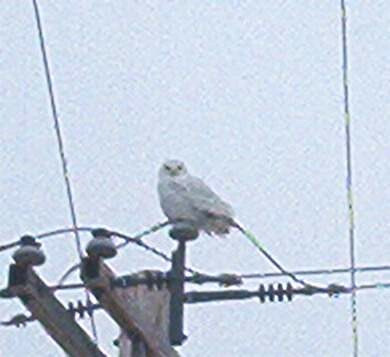 That white along the wing is actually part of the folded lighter colored flight feathers as you can see the wing partially stretched out. This dude was in a weird stage of molt that led to some confusion on my part, even though I think I have the right identification. 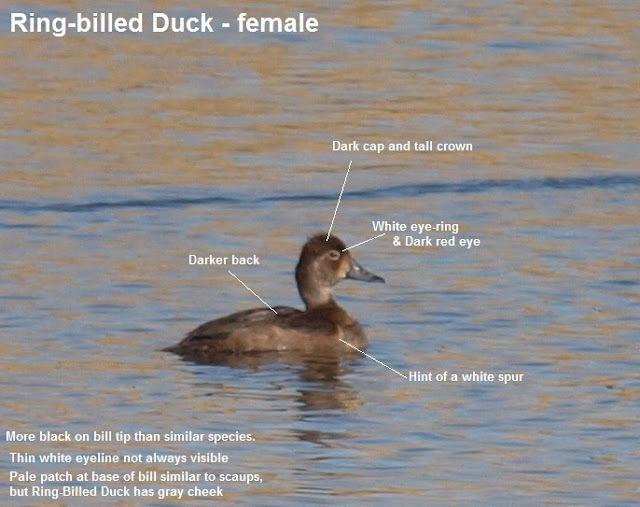 If you can train yourself to note and/or draw these attributes, you will be much better prepared to identify these ducks. Maybe after a few more years and experiences like this one that force me to study my field guides, I will have integrated the knowledge into my hard drive and have instant recognition of these darn ducks. All of us here at "Birding is Fun!" 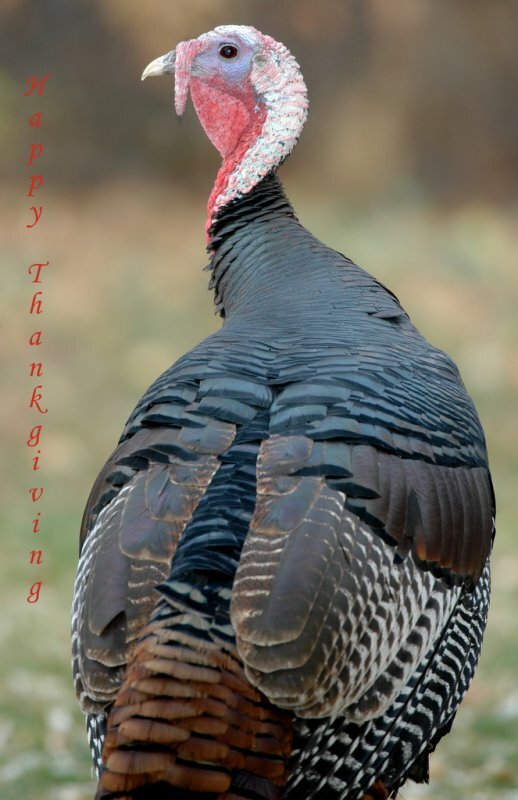 want to wish you and yours the most wonderful and happy Thanksgiving. 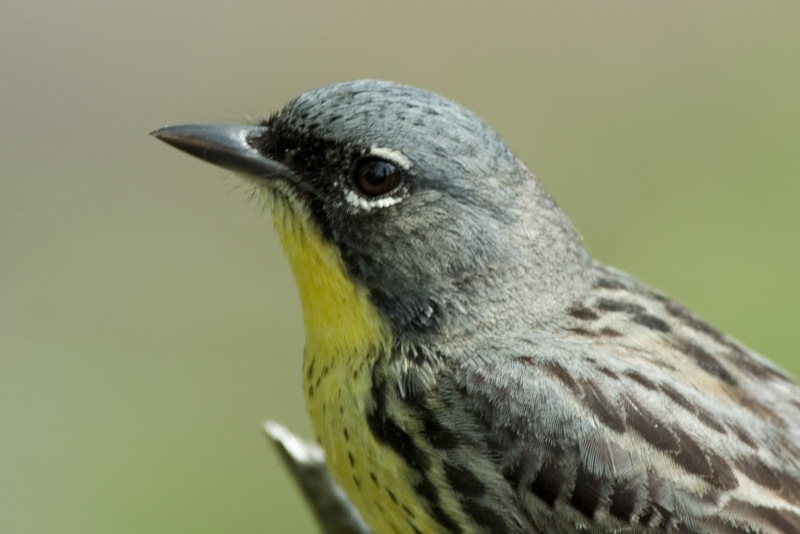 During this season, we are grateful for the birds, for fellow birders, for cool technology like dSLR cameras, and for social media, like blogs, so we can share our passion with you. Thanks for coming back to BiF! day after day. We love you! Our family has named it "Peeping Tom" because it sometimes peeks in on us through the basement windows. 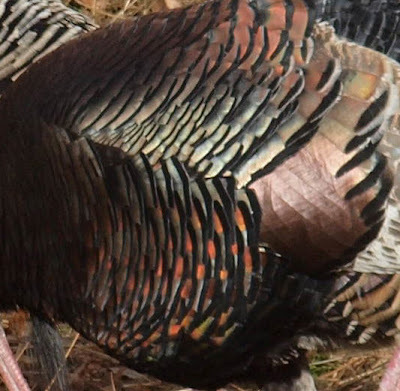 Dan Huber shares Wild Turkey's secondary feather. 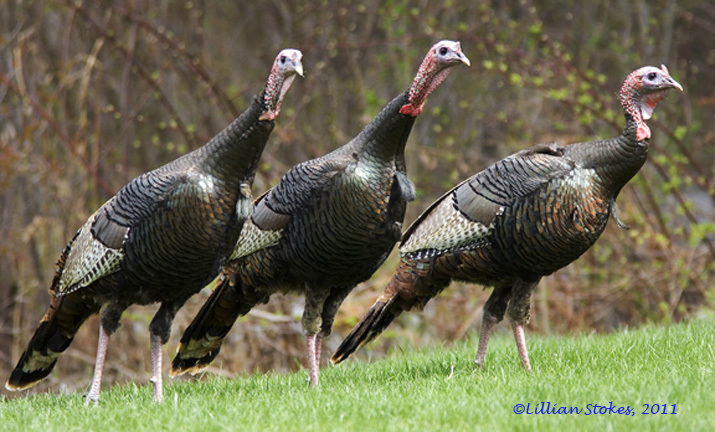 Lillian Stokes has these Turkey's in her yard! Pat Bumstead reminds me that the Canadian Thanksgiving is in October - so a belated Happy Thanksgiving to you all up north, eh! 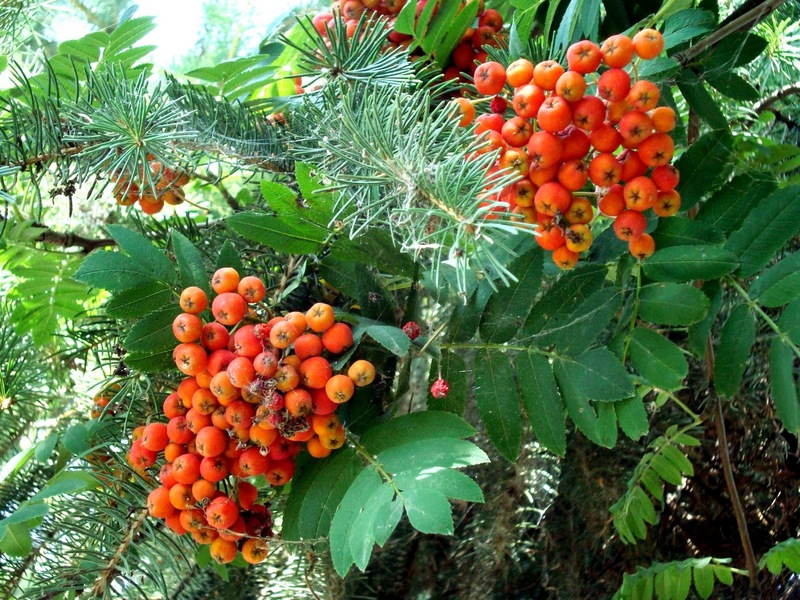 Pat shares with us some Mountain Ash Berries below. 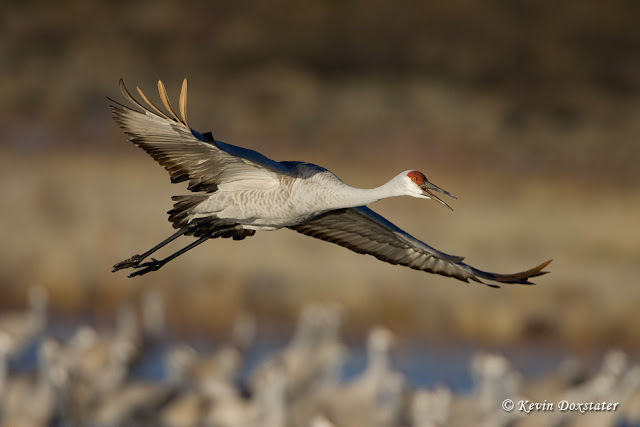 Kevin Doxstater shares that this time of year reminds him of his fantastic trip to Bosque Del Apache NWR and he hopes to make a return visit to see and photograph all the Sandhill Cranes and Snow Geese.